Puoi selezionare fino a 8 viaggiatori in tutto. 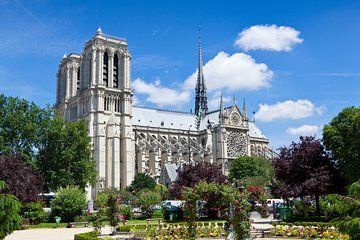 Scopri l'architettura gotica, i manufatti medievali e i secoli di storia in questo tour a piedi di Parigi della durata di 3,5 ore. Dopo uno spuntino tradizionale parigino con caffè e croissant sulla Senna, esplorate la cattedrale di Notre Dame del XII secolo con la vostra guida. Visita la Sainte Chapelle sull'Île de la Cité e ammira le spettacolari vetrate del 13 ° secolo nella navata. Termina il tour alla Conciergerie, una volta parte del Palais de la Cité. Le dimensioni del tour sono limitate a otto per garantire un'esperienza più personalizzata. Incontra la tua guida sull'Île Saint-Louis nel centro di Parigi al mattino o al pomeriggio (a seconda dell'opzione selezionata). Quindi, inizia il tuo tour in tipico stile francese con caffè e croissant in un bar locale. In seguito, visita la Cattedrale di Notre Dame con la tua guida e ammira la sua straordinaria facciata gotica prima di entrare per esplorare ulteriormente. Ampiamente considerata tra le chiese più famose al mondo, la Cattedrale di Notre Dame fu costruita durante il regno di re Luigi VII nel 12 ° secolo e oggi si presenta come uno degli edifici medievali più iconici di Parigi. Ammira le vetrate e i manufatti religiosi esposti e scopri il significato di molte delle statue sopravvissute. Prosegui fino alla Sainte Chapelle, una chiesa del XIII secolo costruita dal re Luigi IX. Durante la vostra visita, ammirate le spettacolari vetrate nella navata e ascoltate come i dettagli della guida le storie che raccontano. La vostra visita dopo la Sainte Chapelle procederà alla Conciergerie. Questo edificio medievale (che ora ospita i tribunali di Parigi) è il più antico palazzo reale di Parigi. Fu residenza e sede del potere dei re francesi per secoli durante il Medioevo, poi fu trasformata in prigione nel XV secolo. Vedrai l'imponente Sala degli Uomini del XIV secolo dove i banchetti si svolgevano nel Medioevo e nella Guardia con le sue volte in stile gotico. Poi visiterai la prigione stessa, con la stanza del Grooming dove i prigionieri condannati sono stati privati dei loro oggetti personali e vedrai le diverse celle, compresa quella di Maria Antonietta, dove trascorse le ultime settimane della sua vita prima di essere decapitata da ghigliottina. Our guide Clemence was wonderful - she was very knowledgeable and informative and had a pleasant disposition. Our private tour turned out to be for only the three of us including my two teenage children who very much enjoyed Clemence’s historical story telling. I highly recommend a private tour. There is so much to see and explore. By having a private tour, we were able to truly understand the magnificence of the cathedral and chapel. The private tour guide was brilliant. Marie Christine was the best tour guide in the world. She has so much knowledge and understanding of the buildings and history. We got chills when she explained how people did pilgrimages to Notre Dame and how St. Louis displayed the crown of thorns. The Conciergerie was incredible and sad at the same time. Listening to how the Queen was treated was difficult and painful. But walking through the halls brought a sense of astonishment for the love of God and Faith. I recommend Marie Christine and will ask for her again when we go to Paris next year! Manuella did a great job showing us the sites of Notre Dame, the Sainte Chapelle and the Conciergerie. She was very personable, and knowledgeable. We would recommend her! Manuela did a great job with the history of Notre Dame and Sainte Chapelle. Our private tour-guide, Marie Christine, was a veritable font of knowledge and we enjoyed every part of this tour. She was a Parisien who had lived overseas and was highly educated so one felt one received an unbiased historic account of these three amazing places. I'd highly recommend this tour, well worth the money. Our guide was well spoken and very knowledgeable about all three locations. The tour is just about the right length of time to be a good overview of the sights. It was a very enjoyable morning. This is an informative and interesting tour. The meeting place was a bit confusing and finding the guide amounted to asking around until you bump into each other. Norte dame Cathedral is a bit of a tourist trap but the Sainte Chapelle and Conciergerie were great. Excellent tour guide, extremely professional and has done this type of work for many years. We were the only 2 taking this first tour of the day so were able to ask any questions and have the guides full and immediately attention. We've been touring Europe for the past month and this guide was one of our favourites forgive us as we forget name, too long a holiday : Would highly recommend this tour to everyone as the history was amazing and were lucky enough to visit this Cathedral during a service. We were also provided a headset so never missed any information during the tour whilst service was in progress. Thank you for such a professional informative tour, we wish we had this guide for our entire trip. Short, concise and time saving! On top of it, the chance to see a great monument.